Gopi runs Gopi Shah Ceramics, a collection of unique handmade ceramics and pottery in Long Beach, California. 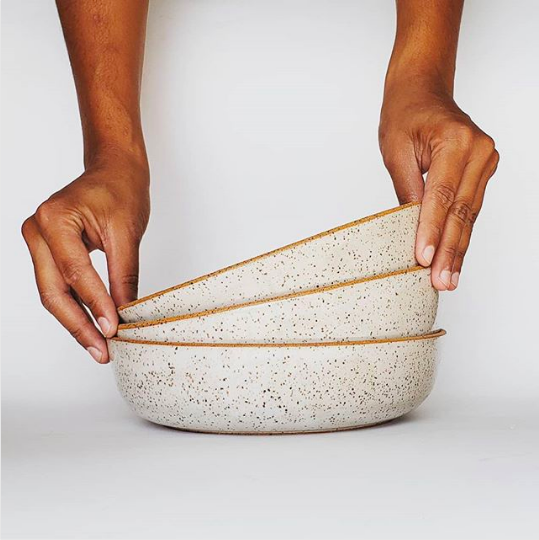 Inspired by Mesoamerican and Andean art, California natural landscapes, and textiles and prints, her work is playful, minimal, gorgeous, and tactile. And Gopi is known as a vibrant, generous force in the maker community. Gopi has moved several times over the course of starting and running her business -- to Austin then San Francisco then Long Beach, CA. In this miniclass, she shares how she makes maker friends and forges professional collaborations, even in places where she knows no one. 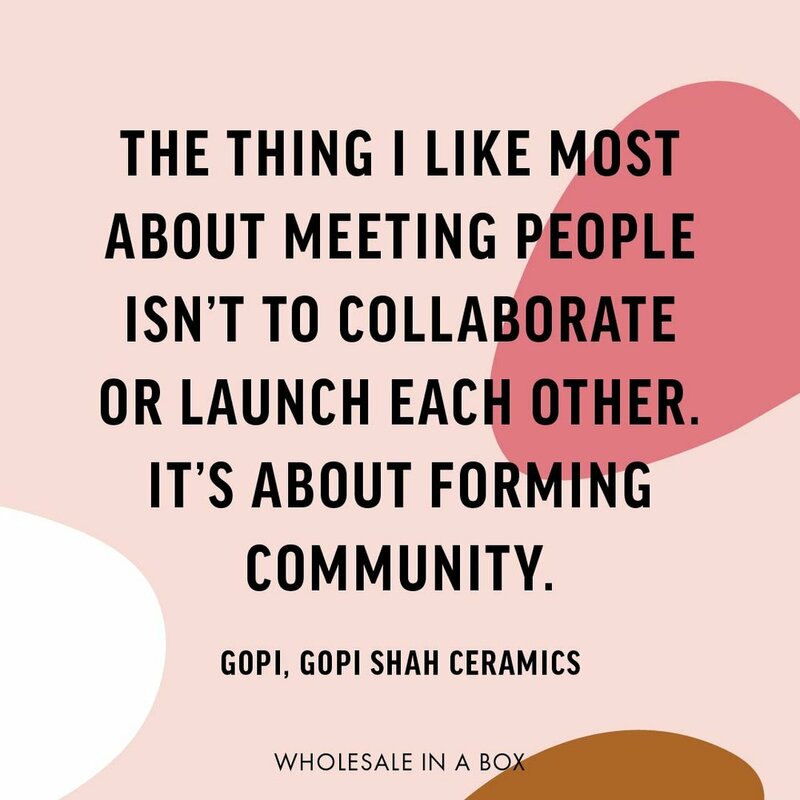 Gopi has grown her business through these collaborations, and found support and community along the way. I’ve definitely grown my business through collaborations and working with other people. But -- the thing that I like most about meeting people isn’t to collaborate or launch each other. It’s about forming community. For instance, when I lived in San Francisco, you feel like walking around in San Fran, people don’t say hello or get to know you. I lost that sense of closeness. So more of my focus has become connecting with people in my area. One simple thing that was great in San Francisco was a potluck. Somebody I met at a craft fair had been there for a while and was a part of the maker community. She got together all these different women makers, about 20 people, for a dinner at her house. We would talk about opportunities and challenges we all faced in this intimate, but informal setting. It was potluck; everyone brought food and people were there to talk, but also network. So a lot of it is just finding that personal sense of connection and closeness, and the growth piece comes from there. I think it is a sense of openness that leads to collaborations. The craft fair circuit has been great. I love it for seeing my customers and get new perspectives on my product -- but it’s also great for networking and meeting other makers. For me, craft fairs have led to my best collaborations -- like with PF Candle Co. They sell my incense burners with their incense and it has been great. My most successful craft fair for meeting new people was Renegade in San Fran. I had just moved to the city a few months before and didn’t have any friends. I love trading with people, so I decided to go down the entire roster of vendors and picked out 10-15 people whose products I really liked. I then emailed them about trading products at the fair. It’s hard to meet people when you’re physically there because everyone is in their booth, so that’s why I emailed them ahead of time. I figured if they liked my products, they’d come talk to me. People passed my booth when they were going to the bathroom or setting up and obviously my name registered with them. So they’d stop and say, “Hey, you emailed me!” and stopped to talk. And obviously, if I hadn’t reached out originally they wouldn’t have. Through that, I met a couple of my best friends in San Francisco -- in addition to meeting the PF Candle Co folks. I think for a lot of makers, there is a lot of self doubt and people are shy about reaching out. I don’t have that problem because I don’t have anything to lose! The worst thing that can happen is that nothing comes of it. But the best thing that can happen is you form a friendship or collaboration. And that is worth so much more than any rejection you might face. Be honest with who you are, where your business is, and where you want to go. And also just be open and friendly. People who are open to collaborations are a unique breed of person. I haven’t had a bad experience yet. Generally, when someone reaches out to me about a collaboration, I’ll do it! So far, all the people who have reached out to me are people who I want to collaborate with. Most of the time, I’m flattered that anyone is approaching me. Maybe I just feel small in a business sense. Any time anyone knows who I am, I’m completely floored. There is a woman who has a company called Pigeon Toe, and one of the founders came up to me at a craft fair and bought some cups from me. I was gushing and so excited! I feel like they are what I aspire to be and I was shocked that she would know who I was and want to buy my products. And they’ve been great -- they’re very open about being mentors to me and teaching me how to improve my business. Business-wise, my collaboration with PF Candle Co has been awesome, especially in terms of sales. They are such a well known and beloved brand. Anytime they do anything, even just mentioning my pieces on Instagram, I get followers. Shops have reached out to me because PF Candle. And Kristen, the founder of PF Candle is a mentor figure, in the sense that I could ask her anything and she would be willing to help me. In terms of satisfaction, my best collaboration was with my mentor, Jennifer Prichard, in Austin when I first moved there. The way I met her was that when I moved to Austin, I wanted to apprentice with a more experienced ceramicist. I googled all these ceramicists, reached out to them cold, and she was the one who responded. That was my first starting point in trying to start my business. She and her husband helped me launch my business and they’ve given me the confidence to try anything. In starting a business, there is so much you’re not sure about and they helped me move through that. I think that is one of the aspects of business where you’re always learning and growing. At first I was winging it, but then I learned from mistakes or from collaborations that went differently than expected. I learned from those mistakes and turned that into new terms and context -- if I do a new collaboration, I take what I learned from past collaborations. First of all, if a potential collaborator isn’t very responsive or something seems slightly off, I’m very hesitant and then I’m a lot more intense with my terms. Generally, though, I’ll do a one-page contract. Just write it up yourself in plain English! I’s always good as a starting point. In case a relationship does go sour, that’s the only thing that you have that you guys can agree upon. Before, I was trying to give everyone the benefit of the doubt, but now I have those boundaries. It is obviously slightly uncomfortable when you’re chatting and going out for coffee, and then when you pull out a contract it seems so legal. People have bad associations with it. But at the same time - if you work with whoever you’re collaborating with and come up with terms together, and come to an agreement on the contact, it sets a good professional tone for the rest of your working relationship. One thing I’ve noticed that really is important in connecting with other people is that I’m always trying to be professional. I am what my business stands for. Over time, that professionalism adds up into a reputation and people will find out about it. On the other hand, I think honesty and empathy are really important, too. For instance, if everyone is doing poorly at a craft fair or maybe it’s not a good time of year for a craft fair - and I mention it but instead of having empathy, you pretend everything’s fine. That makes it really hard to connect because I know everyone struggles at times. When we empathize with each other as makers and business owners, we find that we’ve encountered similar problems in the past and we can work through them together. Rejection is not bad. That’s actually something I’ve learned from Wholesale In a Box. Before I started working with them, I hadn’t reached out to that many stores… or I would doubt my business and my art. Whereas now I think that rejection is probably better. If you have someone that you’d like to collaborate with or sell to and they reject you, it’s better to not have that work out in the end -- it’s better to have someone that is really excited about your work. With Wholesale In a Box, they talk about reaching out to stores three times. I think it’s the same with reaching out about advice or collaborations. Being persistent is valuable, because everyone’s busy and forgets about that one email. Don’t take silence as a rejection - don’t take it negatively if they don’t get back to you. Email them a few times to follow up, and then after that if they don’t respond, then move on. One thing that really stands out about Gopi’s story is that none of her most important collaborations came to her through some connection or asset she already had -- all were from her hustling, being friendly, and reaching out to folks she admired. Connect with people in your area first. We all think of social media first, but maybe there are makers in your town that would be satisfying to connect with. Keep it simple. The potluck that a fellow maker arranged in San Francisco was really meaningful to Gopi but didn’t involve lots of logistics or arrangements. Make the most of craft fairs. Fairs take so much time and energy to prep for already. Gopi suggests going just that one extra step to connect with makers you admire, by emailing them beforehand. Use a contract! It doesn’t need to be in legalese, but writing up a 1-page simple agreement can prevent a lot of confusion and problems down the road. Be professional. You are your brand and you always stand for it, even if you’re not “on” in a given moment. Be honest, be yourself, and be empathetic. Be persistent and don’t take silence as a rejection. If you’re pitching a collaboration or even suggesting coffee to a new friend, you may need to reach out a couple of times to connect. Reframe rejection. A “no” isn’t a bad thing -- it just means that you have more time and energy for other potential collaborations that will ultimately be a better fit.